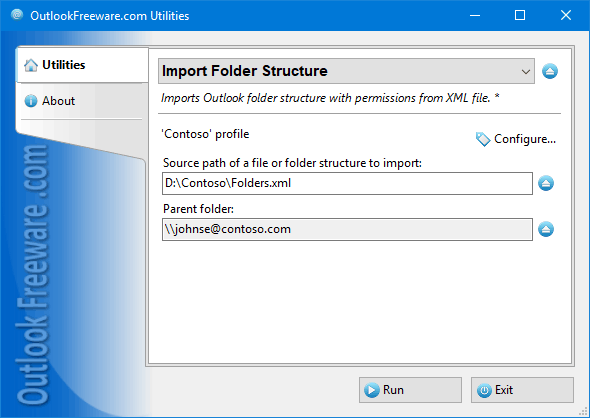 This free utility imports the Outlook folder structure from XML files that can contain the whole complex hierarchy with information about folder types and permissions. This file can be created with Export Outlook Folder Structure utility and edited in any text editor, even in Windows Notepad. When you import an XML file with Outlook or Exchange folder structure, you can select any mailbox, Exchange Public Folder or any other folder in Outlook. The utility creates the entire hierarchy at the selected location, and assigns the correct folder types: mail, contacts, calendar, tasks, and other. In addition, it can set the appropriate permissions in accordance with stored in XML. When actively working with Outlook email, especially when sorting messages, you receive a large number of folders. This number only increases over time. If you need to change your email provider and simply when you create a new Outlook profile or a parent folder for the new project or client, there is a need to create the entire folder structure used previously. Often, this structure contains folder permissions defined, especially with Exchange Public Folders. There are no built-in Outlook features to simplify copying the folder structure from one location to another. Creating folders manually is a laborious process, which leads to different errors. And wrong access rights settings violate the security of the storage of important email, contacts, calendars, tasks, and other sensitive data. Command-line utility automates the process of loading the folder structure to Outlook and Exchange using batch files, scripts and Windows Task Scheduler. Scheduled launch may periodically update the various folder structures and their permission sets.